Metamoris is bringing submission-only grappling to it’s fans in a way that has never been seen before – or maybe they have. Metamoris’ polish in it’s marketing makes it look more like a high budget, high stakes UFC promotion than your typical shaky iphone camera, scractchy audio BJJ tournament in a big open gymnasium. Of course, Metamoris was founded by Ralek Gracie, son of Rorion Gracie-the founder of the UFC. And so perhaps it makes sense that a second generation fight promoter would be able to start such a well polished event on his first try. Metamoris is not just breathing new life back into BJJ tournaments, which have grown stale over the years with point fighters gaming the system, but MMA fighters nearing the end of their career are able to continue competing at the highest level and keep bringing home the bacon. Viewers aren’t left out of the action either; it’s not just the polish and promotion that Metamoris has in common with the UFC, but also the mainstream betting odds. These odds are so lopsided it would be hard not to throw down some extra cash on Chael Sonnen where a $100 bet would net you $1413. Dean Lister is a BJJ savant so the odds do make sense. Where would I put my money? Either no bet or a small amount on Barnett as it still is a big payday in the odd chance Barnett pulls out the “W”. Betting on the draw probably isn’t worth at +198. With the two evenly matched and odds of -273 for the draw, betting on the draw could be worthwhile. Again, the draw seems like a good bet for the same reasons as the Saulo/Rodrigo match. And for the third one in a row. Betting on the draw could make sense. Don’t want to risk real cheddar? If real betting isn’t your thing, Metamoris.com features their funny-money betting, or “Match Voting” as they call it. 1000 credits for voting a draw. 100 credits for voting a submission win. 500 credits for voting before or after 10 minute mark. 1000 credits for voting the actual submission category. Credits can be used to redeem perks for future events. I’ll be voting a draw for every single match. 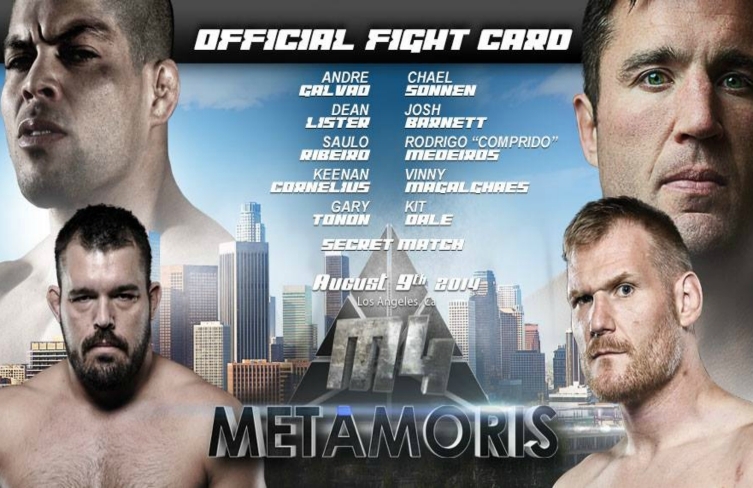 Will you be betting on Metamoris? Will you try “Match Voting”? If so, what are your bets going to be? Also check out GIFs and highlights from Eddie Bravo Vs Royler Gracie from Metamoris 3.